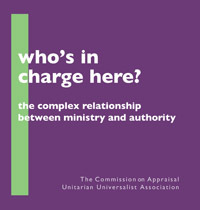 The UUA's Commission on Appraisal has issued their report: "Who's in Charge Here; the complex relationship between ministry and authority." A group of ministers are reading the book together. My colleagues can identify themselves as part of the group as the wish in the comments. The following is my take on the first case study they present: a fictional, composite study of a composite church. I was inspired by our conversation together, but this is not a summary or consensus statement of our discussion: just my take. Making sense of Case Study #1. The first case study -- a composite, fictional situation -- is stereotypical of conflict over authority in a church. My take is that it is the congregation in question ("the UU Fellowship of East Lyndon") has confused “authority” with “informal power”; it has no clear understanding of “authority”. The case church is pre-merger, formerly a fellowship, with a varied history of settled and interim ministries, none of them particularly long lasting and successful. The current minister, a Rev.Hitchens is female and has served three years. There was a congregational faction that didn’t want a minister. One of the board members makes it clear that the reason why the faction opposed the minister was because they wanted power themselves. 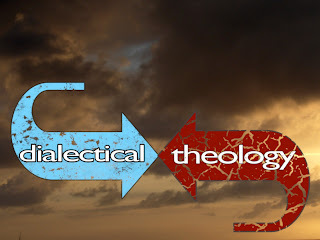 This conflict continues, over the Sunday Services, particularly over the issue of “congregational response’, or the “talkback” as it is more commonly known. The issue of talkback is literally the power of any member to speak on any Sunday about the subject of worship. Any member can take a position equivalent to the minister on any Sunday, or every Sunday. It means that the authority of the minister to craft the message of the worship hour is subject to rebuttal and questioning within the worship hour itself. Rev. Hitchens has done away with “congregational response” and it is still controversial. She has claimed that power. Rev. Hitchens views her authority as coming from her personal qualifications (experience, education, credentialing etc.) but in the end, all of her “authority” ultimately rests on the affirmation that the congregation gives her. Question: does a minister have any authority simply by being the minister, or does the power if the congregation to call and dismiss the minister vacate that authority? The members of the church view her role in very guarded and partial terms: She is “not a critical element of making ministry in the church.” She is more of a “kind of like an employee more than in a Christian church.” The minister “leads in some way.” A minister is a “focal point, that has the message of Unitarian Universalism that’s inspirational.” The minister does pastoral care. That she is, by role, the worship leader is not mentioned. Every congregation has a set of formal and informal power relationships. The power structure is what is. A structure of authority is normative. 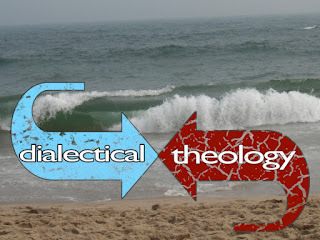 It is the division of roles and responsibilities that flows from the mission and vision of the church, from the ecclesiological tradition of which it is a part, from the best practices and accumulated wisdom of the religious movement it embodies. It is how roles and responsibilities ought to be. There is an authority structure consistent with the congregational Protestant traditions from which Unitarian Universalism springs. In that authority structure, the minister has authority over the worship life of the congregation. The Sunday Service committee is the minister’s team in carrying out that work. The Fellowship movement worked with a different authority structure; it depended on lay led worship. The Sunday Services Committee organized the lay-led services. 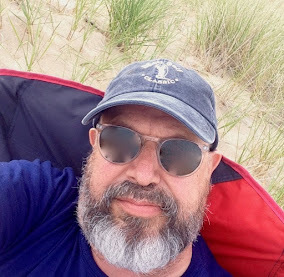 In the case study presented, the question of whether the UU Fellowship of East Lyndon will use the authority structure of a “church” or of a “fellowship” is still undecided, and the subject of a power struggle in the congregation, which Rev. Hitchens is supposed to fix.